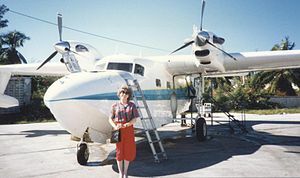 While in college at the University of Miami, we went to Bimini one weekend on Chalks Airlines. Chalks only operated hydro-planes which means they take off and land in the water. On Bimini, at the time, there were only two hotels, Browns Hotel and The Compleat Angler, which was where we stayed. It was quite lively at night with reggae bands and dancing. The year we went, The Compleat Angler had just installed fresh water for showers. Before and at Browns, the showers were salt water. Guess what sold us on The Compleat Angler. The hotel was also known as the hangout of Earnest Hemingway during the 1930’s. Several of his books and stories were penned there, in particular, The Old Man and the Sea. Although not a resident of the hotel, Martin Luther King worked on some of his speeches there too. The island’s population at the time was still quite small. Truck 1, Truck 2 were the license plate numbers. The entire island could be walked in an hour or so, it was only 9 square miles total. Conch Salad Woman sold fresh conch salad from an embroidered basket perched on top of her head. “Conch Salad” she would canter as she strolled the street announcing her wares. There was only one street and it ran the length of the island from the airport, down to the docks that hosted the bone-fishing contests. 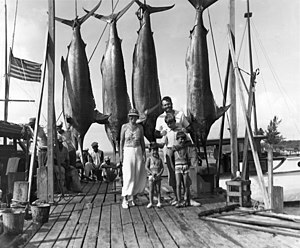 The docks would swell with boats and visitors from south Florida during the fishing tournaments. Conch Salad Woman enjoyed brisk sales during fishing tournament days. Everything seemed to cost “a dallah” from a gallon of fresh water or a rubber pair of flip-flops, to the rum sold in the hotel. The islanders loved American dollars. They would offer to carry your bags or fan you as you laid on the beach for American coins. One morning the desk clerk at our hotel told us to “follow your nose” to find breakfast. We went out the door of the hotel and sniffed our way to the back door of this wonderful woman who was pulling fresh bread out of the oven, “Cinnamon raisin?” she asked, “Butter too?” and with the exchange of a mere three dollars we had this warm loaf of cinnamon raisin bread slathered with butter which we ate on the beach. It was so good! She was known for making bread for people all over the island and rightly so. Flying Chalks Airlines was an adventure. The planes rolled into the ocean, revved the engines and took off and landed in the water. As the plane landed in Bimini, you could see the islanders gathering at the airport to greet the new batch of visitors to their homeland. Viewing the scene through the rooster tail the plane threw as it glided across the ocean towards the landing slip made it exotic, colorful, and exciting. This was a long time ago, in the 70’s; Bimini has drastically changed since then. The Compleat Angler has burned down and now the island is covered with resorts and real hotels. I liked it as it was, but staying the same does not mean progress. I am glad I had the chance to experience the island before it became a tourist destination. 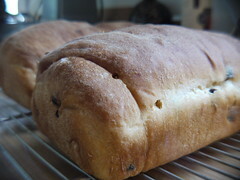 This entry was posted in Cooking Thoughts and tagged Bahamas, Bimini, Bread, travel memories. Bookmark the permalink. OMG! Just found this article & it brought tears… looking for pictures of my grand daddy, Bill Williamson, who fished with Ernest in the 30’s. There were pics on the wall behind the bar of them together. Ernest rod broke during IGFA tourney & grand daddy gave him his rod. EH won the tourney! A month later, a custom rod & reel was delivered to replace the borrowed one. If you know of any pictures please contact me @beckybluejeans or becky_psi2002@yahoo.com Thank you so much. Wow! That’s a great story! Do you still have the rod and reel in the family?